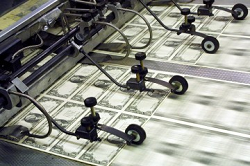 Is the Real QE3 About to Start? Equity futures are up 2% across the board on what many are calling the start of a relief rally. It seems that the media is focusing on potential IMF news, as well as other news related to the Euro. [The Fed], who bought $2.3 trillion of Treasury and mortgage-related bonds between 2008 and June, will start another program next quarter, 16 of the 21 primary dealers of U.S. government securities that trade with the central bank said in a Bloomberg News survey last week. The Fed may buy about $545 billion in home-loan debt, based on the median of the 10 firms that provided estimates. The term "QE3" has been used for various measures taken during the second half of 2011. Many view ECB moves as this possibility, as well as the Fed's "Operation Twist." But if you want to give anything that name, this is it. If the Fed goes back in and infuses the MBS market with that kind of size, then this is akin to the original round of QE that was expanded upon back in March 2009. Can we make some wild extrapolations from this? Sure we can. QE1 saw the Fed in the MBS market to the tune of 1.25T. The first round of buying began in Jan of 2009, and ended March 31st 2010. During that time, the $SPY rallied about 30%. This is not a peak-trough reading. So if these broker/dealers are expecting 545B of liquidity infusion, that's about 40% of the original QE1. With some mathematical hand-waving, we could extrapolate that to a rally to 1300 on the $SPX. This calculation is very rough, and very ambitious. It assumes all other things are constant, and the market is at a different place, both technically and fundamentally. I'm not a macro guy, and my trading is on a much smaller timeframe-- I'm just trying to gain some perspective. But the Fed going directly back into the MBS market is big news. And I believe that it's bigger news than any of the Eurozone drama currently holding the market hostage.